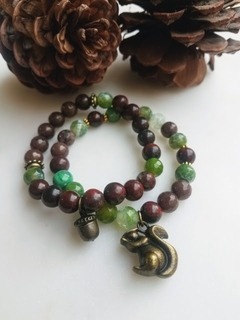 8mm Frosty green agate, brownie jade, pine cone colored jasper + brass totem charms of squirrel and acorn. 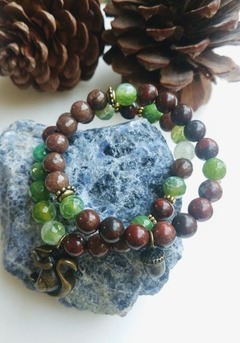 Available individually or as 2 pieces. mix and match with other forest fairy stretch bracelets. When squirrels prepare for the winter, they gather only what they require. This teaches us the importance of letting go/getting rid of unnecessary physical objects, and also negative beliefs, emotions and memories which limit our faith in love and abundance. We need to lighten our load, physically, mentally and emotionally.